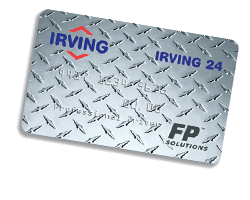 With IRVING 24 you get more than a fueling card - you get a fueling network with over 4,000 locations across North America. Competitive fees and costs based on OPIS, the world’s most comprehensive petroleum information source. Cash advances are a convenient way to offer allowances of up to $200 per day per card. Available at all U.S. Irving locations and designated IRVING 24 and Irving Big Stop locations in Canada, cash advances are easily authorized by calling our Customer Service team at 1.800.561.2447. FP Solutions Checks are a safe, easy and cost-effective way to provide cash to your drivers for everyday expenses and emergencies. FP Solutions Checks work much like personal or company checks, allowing your drivers to access the exact amount they need to quickly get back on the road. Activate FP Solutions Checks 24 hours a day, seven days a week through your Fuel Genius™ account or by simply calling our Customer Service team at 1.800.561.2447. Fuel Genius™ gives you complete, real-time access to the vital account information you need to keep your fleet on the road. Review transactions, set purchasing policies, issue money codes, create customized reports and more. With Fuel Genius™, you have the secure tools you need to manage your IRVING 24 account and protect your fleet against unauthorized or fraudulent card use. Questions? Call day or night! Our Customer Service team is available 24/7 at 1.800.561.2447. We have the right fuel programs to keep your business moving! Which card is right for your business? Tell us about your fueling needs to find out. To complete a previously started application, copy and paste the application reference number from your confirmation email. Which Card is Right For Your Business? Help us determine which of our fuel programs will best meet your needs. Tell us about your fuel requirements. All information regarding the application will be sent to this email address. From which country are you applying? What kind of fuel does your Fleet require? Based on your fueling needs, we recommend the following Fuel Program for your business. If you?d like to talk to an Irving Oil Fleet Sales Representative about this recommendation, we can be reached at 1-866-999-8199 or iomfleetsales@irvingoil.com between Monday and Friday, 9AM to 5PM AST. Purchasing Controls - Change limits in real time! Prefer the printed version? Print and mail this PDF PDF form to complete your application. United States: East Midwest West Miss. The Customer named below (?Customer?) authorizes Irving Oil Marketing, Inc. (?Irving?) to originate debit or credit entries to its checking account designated above and authorizes the financial institution named above (?Bank?) to accept and to debit or credit the amount of such entries from or to the Customer?s account. Debit entries will be limited to amounts owing for products and/or services purchased or rented using credit cards or other credit instruments governed by the Cardholder Agreement ? General Terms and Conditions. Irving may, but shall not be required to, pre-notify Customer of debit or credit entries. This authorization agreement (the ?Agreement?) is governed by applicable clearinghouse operating rules in effect from time to time. Terms and conditions governing transfers originated under this Agreement may be amended from time to time by written agreement of Irving and the Customer. This Agreement remains in full force and effect until Irving receives 30 days prior written notification of termination from Customer, however, in no event will the termination be effective with respect to debit entries originated prior to Irving?s receipt of notice of termination and until payment for all products and services purchased or rented prior to Irving?s receipt of the notice of termination has been received. Irving reserves the right to terminate this Agreement at any time by written notice to the Customer. In the event any debit entry is returned to Irving uncollected, the amount of the entry will be immediately due and payable along with any associated bank charges. In the event any debit entry originated by Irving proves to be in error, Irving?s sole obligation to the Customer shall be to originate correcting entries upon proof of any such error or errors. Your Fleet Card Application is now complete and ready to be submitted. Please accept the below terms and conditions to finalize the Application Process. You should receive an email response in 5-10 business days, once your application has been processed.